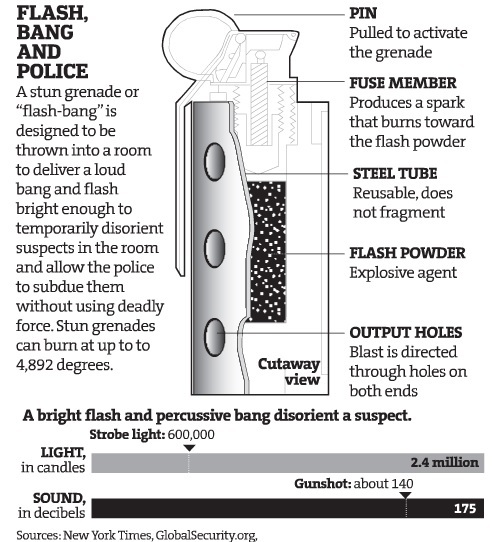 An investigation co-published Monday by ProPublica and The Atlantic points out the potential for maiming and death from flash-bangs, the stun grenades used by police during drug raids. It's an issue Minnesota should know well. Back in December 2011, the city of Minneapolis paid $1 million in compensation to Rickia Russell, a woman who suffered bone-deep burns after a Minneapolis police raid in 2010. The city called it an accident and no officers were disciplined or charged. Our followup story noted the toll of flash-bang deaths and injuries nationwide, including a tragedy in Minneapolis in 1989 in which an elderly couple died in a fire caused by a police grenade. Three years later, however, it appears that the growing national "disquiet" has not stemmed the popularity of a device that police say makes them safer. The ProPublica story features a database with accounts of people injured or killed by flash-bangs. One of the accompanying documents is the lawsuit filed by Russell against the city of Minneapolis, which includes the gruesome photos of her injuries.